Renae Rokicki and Ann Salvagni in the woods. Health administrator Renae Rokicki has not one iota of outdoors in her blood. She does not hunt or hike or camp. But she does believe in coincidences, which is how she ended up a member of a team that is summoned to search and rescue missing hunters, hikers, campers and others who go missing in the wilderness of Central New York. Three years ago before bed one night, she caught a story on the television news about training for the region’s Wilderness Search and Rescue program. The next morning, a friend who lives out of state was effusive in a Facebook status update about her work with a search team that resulted in locating a missing child. Rokicki decided to look into joining. Ann Salvagni is a registered nurse who enjoys hiking and the outdoors. A paramedic friend suggested the search and rescue program needed people with her skills. So she looked into joining. 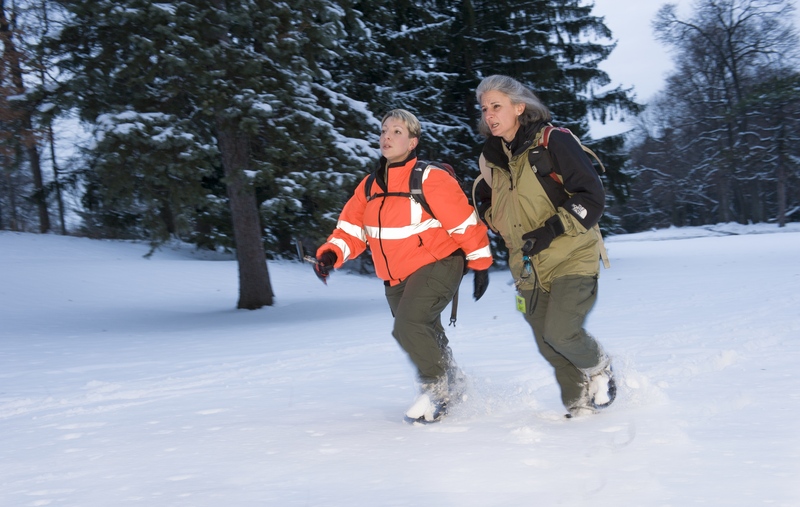 Salvagni and Rokicki are Upstate colleagues who volunteer together on the region’s Wilderness Search and Rescue team. That means they underwent training and certification and continue training with the team at least twice a month in all kinds of weather. They purchase their own uniforms and gear and gasoline. And they are basically willing to respond to outdoor emergencies throughout the region, at any hour. They receive no compensation, and people who are rescued receive no bill. The Search and Rescue program relies on donations and volunteers. “When hunting season starts, that’s a very busy time for us,” says Salvagni. Rokicki says one type of rescue that is becoming more common is “an elderly person with dementia who has wandered.” The team is trained to support a program called Project Lifesaver through the Onondaga County Sheriff’s Department, which provides arm bands with tracking devices to people who are known to wander. When the team is activated, members arrive with the food, water and equipment necessary to sustain themselves for as long as possible, knowing they may be needed for hours or days. Salvagni says her volunteer role is part of growing, as a person and as a professional. Members of the Onondaga County Wilderness Search and Rescue team (www.wsar.org) work closely with the Oswego County Pioneer Search and Rescue team (www.oswegosar.org) The teams seek volunteers who are in good health, at least 18 years of age and able to pass a moderate physical fitness test. This entry was posted in community, emergency medicine/trauma, volunteers. Bookmark the permalink.